GE selected Big Spaceship to define the digital presence for Healthymagination, an ongoing dialogue around better health. The agency established this effort as a shared commitment to creating better health for more people, together. Healthymagination is a celebration of individuals and groups that are innovating the world of healthcare—by improving the patient-doctor relationship, advancing medical treatment, and transforming good health into a lifestyle. 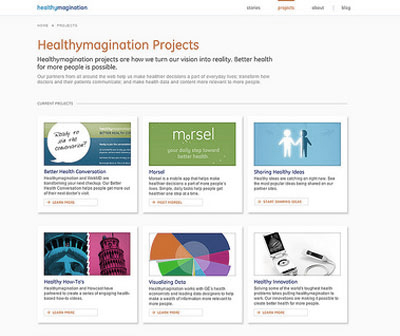 The Healthymagination ecosystem extends into media-rich stories, a blog, social media channels, data visualizations, and partnerships with WebMD, GOOD, and others. I worked with a team of strategists to define the editorial voice for this engagement and to extend that voice onto the Healthymagination site (particularly the blog), on Facebook, and Twitter. I also created content for Morsel, an iPhone app that translates healthy behaviors into simple daily tasks. Over 20,000 Morsels were completed with the first two weeks of launch. Lastly, I wrote a feature story exploring arts-based therapies that MoMA and others are employing to transform how we understand and treat Alzheimer’s disease. Good stuff.